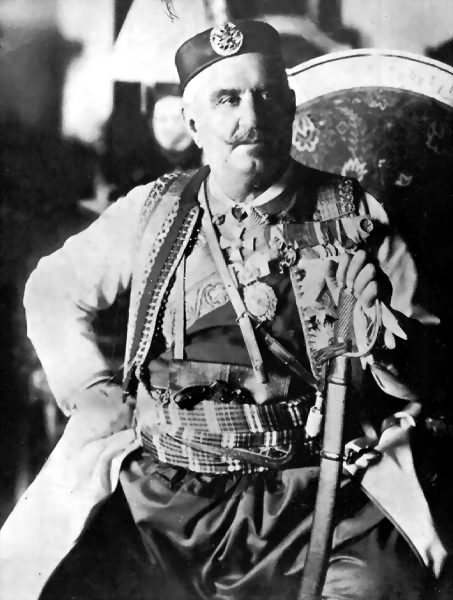 Montenegro, the poorest kingdom in the Balkans, had declared war against Austria on August 7, 1914, and her little Army of 40,000 men had rendered effective aid to their kinsmen in Serbia from the beginning of hostilities. Montenegrin artillery on Mt. Lovcen, had shelled the port of Cattaro and other Austrian towns along the Adriatic Sea in August, 1914, and the infantry occupied Scutari. When the Serbians were making their victorious assault on Shabatz, and the Austrians were stampeding across the Drina, the Montenegrins attacked the Austrian Army on the frontier, compelling their retirement. The Montenegrin Army, commanded by General Yukovitch, then advanced into Bosnia and at Bilek, on September 2, 1914, won a signal victory over the Austrians, taking many prisoners. A week later the Austrians met defeat at Foca. The Serbians then sent an army into Bosnia to unite with the Montenegrins in an advance on Sarajevo, but the Austrians were now in such strong force that both the Montenegrins and Serbians withdrew from Bosnia. 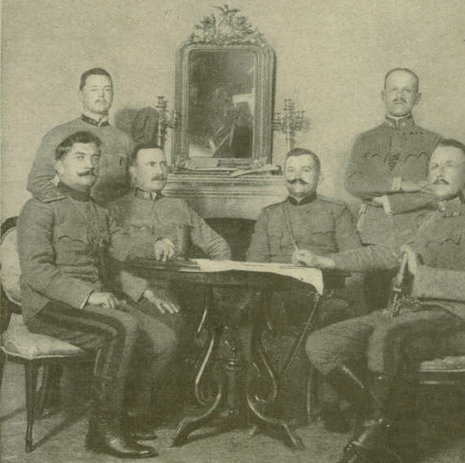 The Montenegrins continued to assist the Serbians through the campaigns of 1915, supporting the left flank of the Serbians' position, and holding the lines around Fotcha and on the Lim River. After Serbia had been crushed, in the fall of 1915, Austria began to lay her plans to eliminate Montenegro. At this time a huge Austrian Army guarded the frontier, while King Nicholas's forces had dwindled to 40,000 effective men. Despite these inequalities, the Montenegrins were able to smash an Austrian Army at Bielo, in the closing days of 1915, driving the enemy back as far as Ivania. 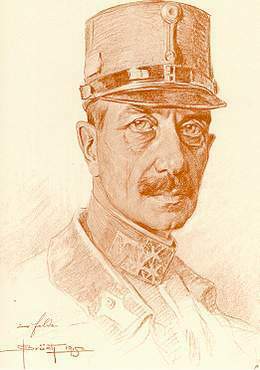 The main Austro-Hungarian Armies were assembled on January 6, 1916 for a general offensive against Montenegro on two fronts, General Koevess directing the movements. While the Eastern frontier of Montenegro, along the line of the Tara, Lim and Ibar Rivers, was being shelled by the great Austrian howitzers, the warships in the Gulf of Cattaro on the Western front began a violent bombardment of Mt. Lovcen, lasting four days. The Austrian Infantry then swarmed up the mountain slope and seized Lovcen, driving out the small Montenegrin garrison defending the town. The Montenegrins had long since expended all their ammunition and they were short of food as well. Moreover, their resistance had been weakened by the knowledge that Premier Minskovitch, a secret friend to Austria, had been negotiating for their surrender. With their stronghold, Lovcen, in the hands of the enemy, the Montenegrins were forced to abandon their capital, Cettinje, on January 13, 1916. Many of the Montenegrin soldiers laid down their arms, but a greater number escaped to Albania, uniting with the Serbians. The Austrians occupied Scutari on January 23, 1916 and San Giovanni di Medua two days later. The conquest of Montenegro was now complete. King Nicholas, meanwhile, had sued for peace, and it was unjustly alleged that he and his German wife had long intrigued with the Austrian diplomats. These rumors ceased, however, when it became known that King Nicholas had refused the terms of peace offered by Austria and remained with his two sons at the head of his troops, prepared to organize a final defense and take part in the retreat of his unconquered army. On January 23, 1916, King Nicholas arrived in Rome at the court of his son-in-law, King Victor Emmanuel of Italy, and from thence he journeyed to Lyons, France, where the capital of Montenegro was temporarily established by courtesy of the French Government. Faced with Russia, Austria–Hungary could spare only one-third of its army to attack Serbia. After suffering heavy losses, the Austrians briefly occupied the Serbian capital, Belgrade. A Serbian counterattack in the battle of Kolubara, however, succeeded in driving them from the country by the end of 1914. For the first ten months of 1915, Austria–Hungary used most of its military reserves to fight Italy. German and Austro-Hungarian diplomats, however, scored a coup by persuading Bulgaria to join in attacking Serbia. The Austro-Hungarian provinces of Slovenia, Croatia and Bosnia provided troops for Austria–Hungary, invading Serbia as well as fighting Russia and Italy. Montenegro allied itself with Serbia.